Students match a parabola to 3 forms of its equation in vertex form, in factored form, and in standard form. There are 24 puzzle pieces, which build 6 puzzles with 4 pieces each. Students get practice converting quadratics between forms while seeing how all three forms can describe the same graph. 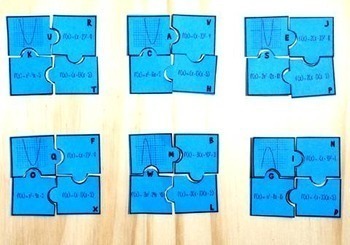 Puzzle pieces are not matched on the sheets so that students can be in charge of cutting them out. 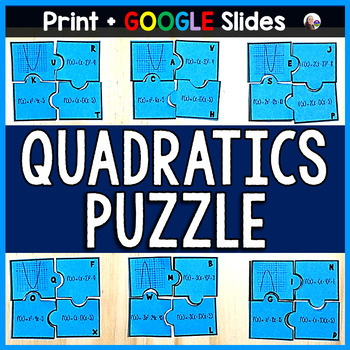 The preview is a completed activity printed on colorful paper (actual puzzle pieces are larger, 2 completed puzzles will fit on 1 piece of paper).